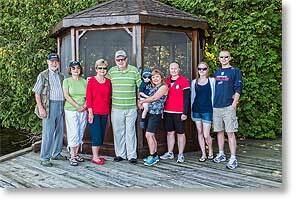 Wednesday, 21 August, 2013 - This past weekend was the annual Cottage Weekend gathering of Sandra's family at Garth and Betty's cottages on the shore of Sturgeon Lake near Lindsay, Ontario. Photo on the left (click on it for a larger view) shows those who attended (L-R: Me, Sandra, Betty, Garth, Jack being held by Margie, Danica, Becky, and Nick). A file of that photo suitable for printing at 4x6 inches can be downloaded here. Sandra and I left for the cottage around midday Friday and had an uneventful three and a half hour drive in ideal weather. Like last year, this year's cottage weekend ended up being a very low key affair with everyone not straying far from the cottages. In years past the girls would go on a drive to one of the neighboring towns for a shopping spree and dining out, but not this year. Also, John didn't attend, staying home in Ottawa, apparently ill. Jack, of course, was the center of attention and was remarkably good, especially considering he's now a two year old. Mostly everyone just lounged around, ate, walked, napped, swam, read, and sat on the docks watching activity on the lake. I, of course, took photos whenever and wherever I found them. The most notable event of the weekend for everyone but me was Saturday morning when Garth took everyone else out in his speedboat for a turn around the lake. I didn't go because I just wasn't in the mood, preferring instead to take photos of the event from land. Also, that evening after supper, we celebrated Sandra's upcoming birthday since this year is her 65th and in a couple months will start getting old age pension, a worthy event to celebrate. Normally for cottage weekends I take all my cameras, but this year I took only the newest one, my Fujifilm HS50 EXR, figuring that with its 24-1000mm lens and fast accurate focusing it would handle any situation I'd be interested in photographing and it did, like this photo of two loons taken from Garth's dock. The docks at Garth's cottages have a great sunset view over water, but unfortunately they don't have any kind of sunrise view. Despite that, Saturday morning while out on the dock at sunrise (not being in the mood to do a sunrise drive), I did get this photo that I'm happy with of a cormorant taking flight. The most notable event of the weekend for me was when Sunday morning did find me in the mood to go for a sunrise drive. So just before dawn I headed out, stopped at a Tim Horton's in Lindsay to get a coffee, and then drove over to the Double "M" RV Resort & Campground where Sandra and I had spent quite a bit of time back in our full-time RVing days. Double M is on the banks of the Scugog River where I have taken a lot of sunrise photos in the past and hoped there would again be photos waiting for me there and wasn't disappointed. 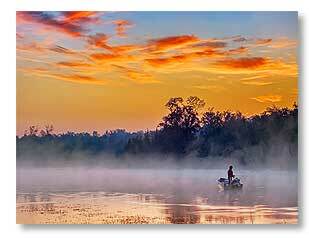 Not only was there a beautiful sunrise and mist on the river, but there was also a fisherman out on the water posing ever so nicely for me (photo above right). Then it was back to the cottage and after lunch, Sandra and I headed for home and enjoyed another uneventful drive in ideal weather, the weather for the entire weekend having been ideal. For my other latest photos, click here. Thursday, 8 August, 2013 - Two years after buying a little inflatable boat, I finally got around to launching it on Tuesday. 1) this is the first summer since buying the boat that I haven't had to spend hours every warm day trying to keep the boxelder bug invasion under control. 2) the boat came with a hand air pump, but it took forever to inflate the boat with it and it wasn't until a few days ago I saw a little electric air pump on sale that looked like it would work. So, I bought it, tried it, and it does a fine job of inflating. As it turned out, yesterday was the first day the weather was suitable (sunny, warm, and no wind) at the same time I was in the mood to give the boat a go. 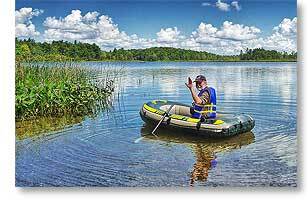 For its maiden voyage I decided on nearby Otter Lake because it's scenic, I'm familiar with it, there's no current to speak of, and it has a publc boat ramp and dock. Sandra went with me and watched, so in case something dire happened she could call 911 on her cell phone, but all went without a hitch, except I don't seem to have the intuitive coordination for rowing that I once did. My goal was to get to the far shore visible in the photo above (shot by Sandra) and coordinated or not, I did manage to get there as can be seen here. While rowing, it didn't feel like I was making much headway, but I clearly was because the round trip only took a half hour or so. That said, I didn't buy the boat to do long voyages, just to get out on the water beyond obstructions on shorelines that block views I want to photograph. We Cross The US Border! Tuesday, 23 July, 2013 - Four and a half months from the time Sandra was notified that the US Immigration case against her had been dropped, we finally got around to crossing the border into the US for the first time since 26 October 2008 when we were on our way to Texas in the RV for the winter and for the first time since Sandra was refused entry into the US on 19 October 2009, totally destroying our retirement plans. T he day after driving to Ottawa on Wednesday, 10 July 2013, to have a basal-cell carcinoma cut out from below my left eye, we packed up and left home Thursday morning, 11 July, heading for the US border at Buffalo, NY. We got through Ontario’s Golden Horseshoe megalopolis with only one traffic jam (nothing short of a modern day miracle) and spent the night at Niagara Falls, Ontario in preparation for attempting to cross the US border the next morning at Buffalo. Why there, you might ask? Because that’s where our US immigration lawyer is located and where Sandra was turned back almost four years ago. We wanted the lawyer close at hand in case the border personnel caused a problem again. However, before we faced that, we had a very pleasant time at Niagara Falls Thursday evening. 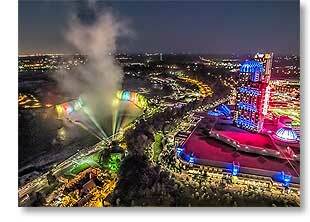 Our hotel (Best Western Fallsview) is a fairly short walk from the Falls and the Skylon Tower, although the walk involved a hill. In total, I was up and down that hill three times and Sandra twice. Good exercise, but we're getting too old for that much exertion. We first went down to the Falls before having supper at a Swiss Chalet and then the second time after supper for sunset and to go up in the Skylon Tower for night photos of the city lights and lights on the Falls (photo above right). Sandra, who hates heights, even went up the tower with me. My third visit to the Falls was Friday morning for sunrise. The joy of sunrise at Niagara Falls is it’s about the only time one doesn’t have to deal with crowds everywhere one turns. I almost had the place to myself. Friday morning on arrival at the border at 8:45am, we sat in a backup of traffic that took fifteen minutes to get through before reaching the guard booth. There, the border guard seemed confused as to how to handle the situation with Sandra and eventually decided we had to go inside the building, which we knew all along we would have to do. Inside, site of one of the most abusive, frustrating, and traumatic times of our lives, Sandra and I encountered a completely different attitude from the immigration agent we talked with. This time, the agent was courteous and polite and even said the law that had caused all the trouble had never been intended to be applied to Canadians. After the 45 minutes it took waiting to see him, talk with him, and for him to then update the computer so Sandra would no longer have trouble crossing the border, we at long last entered the US and were on our way to see my family in Ohio, first to spend a couple days with Carol and Rick near Cincinnati, but not before encountering one traffic jam after another along the way trying to get through Columbus. I’ve never seen such horrible traffic, however we did eventually clear the city and arrived in due course at Carol and Rick’s. It was great to see them again after such a long time and we had a wonderful visit. Carol was a real trooper, going out of her way catering to Sandra’s very restricted diet and to my gluten intolerance. 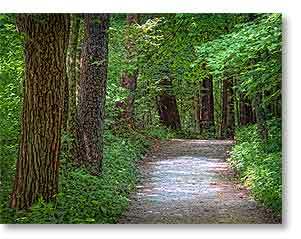 Saturday, she and Rick took us for a hike and photos in Sharon Woods (photo above left), a beautiful Sharonville (Cincinnati) park we hadn’t visited in nine years. Sunday saw us leaving Cincinnati and driving up to Dayton for an hour’s visit with Ian and his family, three of whom (Violet, Oren, and Max) Sandra and I had never met because they were born during Sandra’s banishment from the US. We had a lot of fun playing with all six of Ian and Tracy’s kids, but especially enjoyed getting to know the three newest ones. 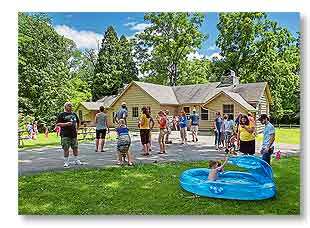 From there, it was on to the John Bryan State Park Day Lodge near Yellow Springs, Ohio for the 41st Wolford Reunion (photo on the right). Attending the reunion was the main reason we waited so long to cross the border after Sandra’s immigration case was dropped. It had been nine years since the last time we attended my paternal family’s reunion and I was wanting to see my cousins again. My grandparents, parents, aunts, and uncles have all passed away, so my cousins and I are now the oldest generation. I had hoped to also see all my grandkids there too, but Tracy had decided not to take their three youngest ones, which was why we stopped to see them in Dayton on the way to the reunion, but happily she changed her mind after we had left, so Ian ended up bringing his entire family to the reunion, which gave me some bonus time with them. 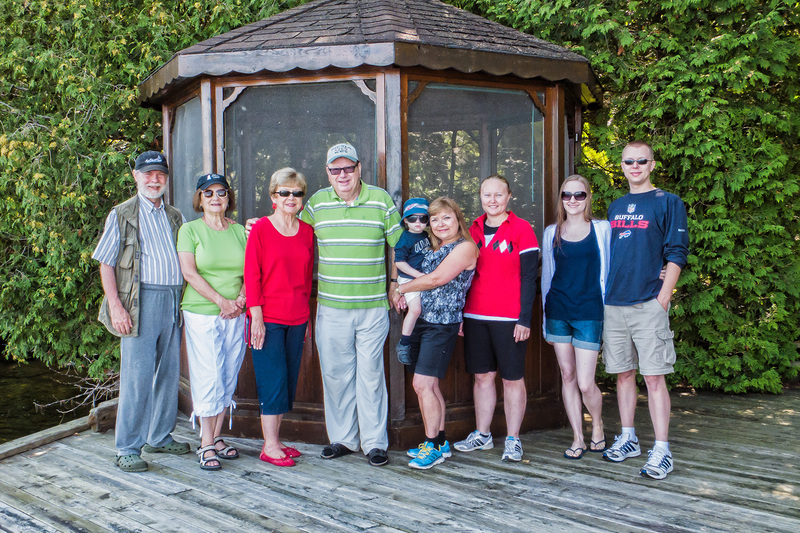 Michelle and her family also attended the reunion, so in one day I got to see both of my kids and all nine grandkids. It was a wonderful time, even though it was more hot and humid than Sandra and I are used to at this time of year. I’ve posted 26 reunion photos on Facebook, but if you don’t have access to Facebook I also created a gallery of reunion photos on PBase.com, which can be viewed here. That gallery also has a convenient slideshow function in the upper right corner. Then it was on to Columbus to spend a couple days with Michelle and family. Sandra had found a reasonably priced hotel (Extended Stay America) near Michelle’s house that had kitchenettes in the rooms so Sandra could prepare meals for her very restricted diet. Monday morning, Michelle had to be away to take Faith to camp, so I was up well before dawn and drove down to Ohio’s Hocking Hills State Park for a photoshoot. With cataracts and another vision problem, I detest driving in the dark, especially on unfamiliar roads, but I wanted to be in the state park for sunrise and before people started arriving and getting in my way, so I sucked it up and endured the dark drive. The Hocking Hills are what I consider to be the most beautiful area of Ohio and one I had visited several times over the decades I lived in Ohio, but hadn’t visited there in so long I couldn’t remember when the last time was, but definitely long before digital cameras were around, so I was way overdue for a visit and anxious to take some digital photos there. It was still dark when I arrived, but dawn broke shortly after that and found me with camera and tripod in hand hiking along one of the many trails there. In all, I spent about three hours blissfully shooting photos of natural beauty (like above left of Cedar Falls) before it got too warm and with too many people starting to show up. There was a lot I didn’t get to see, but maybe there will be a next time. 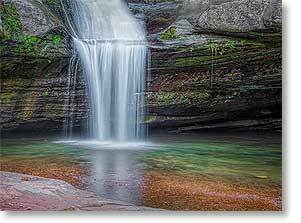 Click here for a gallery of my Hocking Hills photos. Then it was time spent with Michelle and her family, sans Faith. Like Carol had done, Michelle went out of her way to accommodate Sandra’s and my diet restrictions, so we ate very well and had a wonderful time in Columbus too, culminating with Michelle and family taking Sandra and me for a hike along a nearby nature trail that’s in the heart of Dublin, Ohio to see the Indian Run Falls. Unfortunately, trees and other foliage have been allowed to grow and block much of the view from the observation deck. Wednesday morning saw us up, dressed, fed, packed, and on our way by 7:30am. This time, although traffic was heavy, we managed to get out of Columbus without being stopped by traffic jams and from there it was clear sailing toward Ontario. We had planned on the trip taking two days again, but we arrived at Buffalo, NY (the halfway point) around 1pm which was too early to stop for the day, so we kept going and since we were both holding up well after a few more hours, we decided to just go ahead and do the 615 mile (990 km) drive in one day. We arrived home around 5:45pm, tired after the long 10 hour and 15 minute drive but without back problems. Obviously the new car is easier on my back than the previous car, so this bodes well for future trips back to the US. Monday, 1 July, 2013 - Today is Canada Day, Canada's celebration of independence from Britain 146 years ago in 1867. So, happy Canada Day to all who observe that holiday. We have no plans to do anything special for the holiday today, although we might drop by a few of the local events in town and then watch the fireworks this evening from the yard. Yesterday, even though it had only been a week since our last visit, Sandra and I drove back to the Purdon Conservation Area since its famed colony of Showy Lady's Slipper orchids were reported to be at their peak and we had never been there at that time. It was an interesting visit, but while there were more orchids in bloom, many of those we had seen last week had turned brown and were wilted, whereas last week none were wilted and many that we saw were in the early stages of blooming, so I think that was the better visit. Not to mention, being a holiday weekend this time, quite a few more people were there, many of said people being serious photographers with some seriously big DSLR cameras and lenses, and a number of said photographers were stretched out down on the boardwalk in order to get a low angle on the blooms, like the angle on the photo in my previous report, except I don't have lay down to get low angles because my latest cameras have articulated displays. 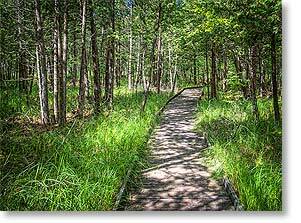 The photo above is of the boardwalk that goes through Purdon's fen where the orchids grow. For my other latest photos, click here. Saturday, 22 June 2013 - Thursday was one of those gorgeous summer days (although it was technically still spring) that we get a lot of up here  blue sky with a few fluffy white clouds, low humidity, and perfect temperature  so at Sandra's suggestion (because I had forgotten all about them) we made the hour's drive over to the Purdon Conservation Area to see its famed and rare colony of Showy Lady's Slipper orchids. 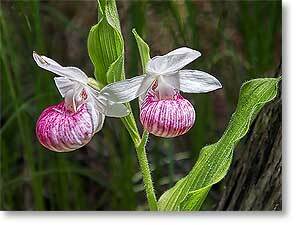 Apparently, Purdon CA has 16,000 orchids, which makes it the largest colony of Showy Lady's Slipper orchids in Canada and possibly the largest in North America. For my latest photos, click here. Copyright © 2012 by Gordon L Wolford . to ask about purchasing any of them. from the mothers of other species. if it came a little later in life.